Delicado, personal y diferente a las demas esencias de traditcion cubana. This was my first foray in to an aged rum, I honestly didn’t know there were so many varieties and styles to look forward to. Rum was rum, you mixed it in drinks and it tasted good. Well I came across some cocktails that asked for aged dark Cuban rum, so I went looking for some. 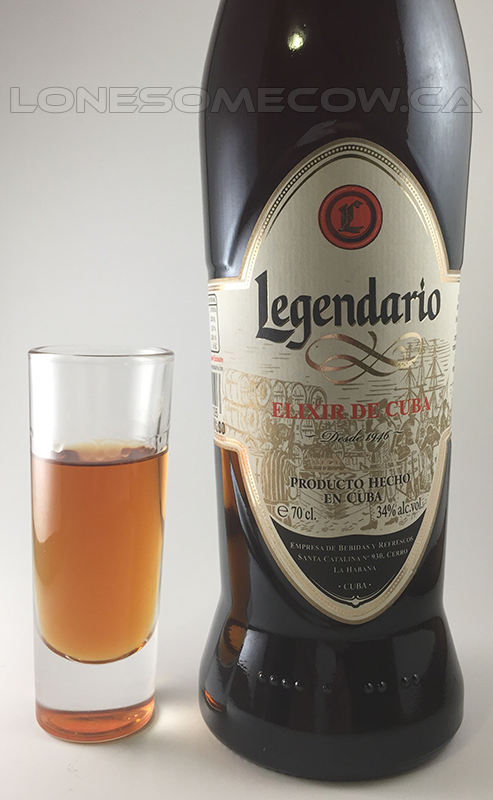 I can’t tell you much about the history of Legendario, since I can’t read the label. But it’s from Cuba, and it has a “7” on it, which I take to mean aged 7 years, which is a good age for a rum, based on the other varieties available at my local liquor store. It was moderately priced, far less than a scotch, but of only half as old, so again that makes some sense. I have to say, this is one of the best straight up liquors I’ve tasted. Nosing it I immediately got fruit, and sweetness – like plum or cherries. The initial taste is very sweet, almost like molasses – with a heavy dose of fruit, raisins, currants or some kind of dark fruit. There is a hint of caramel, and an overall sweetness that lingers in the mouth. The texture is like honey, not quite as thick, but thicker than an average drink. It is syrupy, sticky, and coats your mouth to keep the taste lingering long after it’s swallowed. There is a very subtle burn in the back of the throat that doesn’t linger. Overall it was a very pleasant experience, and will become one of my bar staples for a nice warming sipping liquor late in the evening.